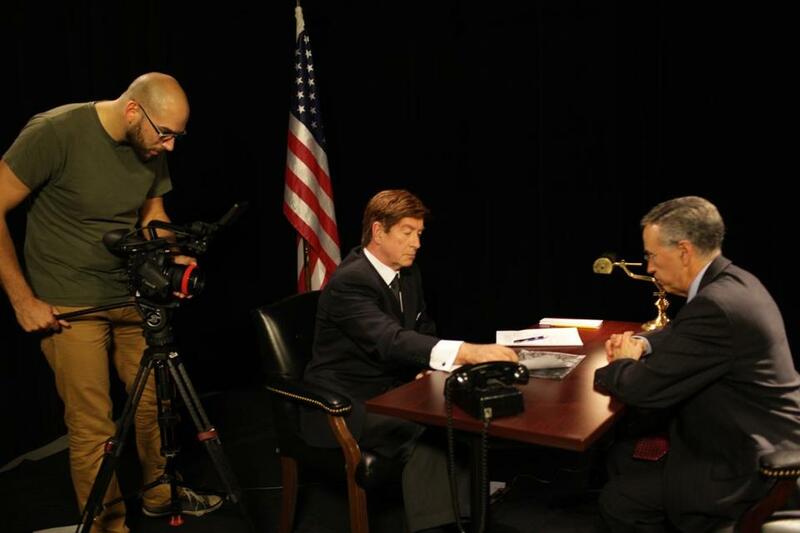 “The Folklorist” coproducer Andrew Eldridge taping Mike Lowe (center) and Herbert Fuchs in a scene on the Cuban Missile Crisis. On a recent Tuesday afternoon, several actors in Colonial garb were hanging around the studio at NewTV in Newton waiting to tape scenes for “The Folklorist,” a locally produced history show that is seen by viewers across the country. The show is not only on the cutting edge of the changing world of public-access television, but also winning awards along the way. Its list of recent kudos includes an Emmy from the New England chapter of the National Academy of Television Arts and Sciences for outstanding historical or cultural program in its 2013 season, beating out local heavyweight “Chronicle,” and shows produced by Maine Public Broadcasting and Connecticut Public Television, according to the chapter’s website. “The old model was broken, so we are turning ourselves into something new and relevant,” said NewTV’s executive director, Robert S. Kelly, who came to Newton from a role at the public-access system in Waltham in 2008. While NewTV still does all of the traditional things that local cable channels have done from the start, including covering government and school meetings, local sports, and cultural events, it has added staff-produced original programming that can be shared locally, regionally, and nationally, Kelly said. The change has made it easier for stations to share programming, according to Kelly. With public-access television losing members and revenue and increasingly being lost in the shuffle of more and more cable options, Kelly said, NewTV came up with a strategic plan to start taking advantage of the new format. The station, on Needham Street just behind National Lumber, added a department to oversee the original shows developed by staff members, and upgraded its equipment and studio several years ago, setting the stage for its hit show. “The Folklorist’’ came about after a conversation with John Horrigan, who in his spare time takes part in historical reenactments and would become the show’s host. Horrigan, a longtime friend of NewTV operations manager Steve Russo, visited the station in the fall of 2011 and began telling colorful stories about interesting, little-known events in history. Immediately, said NewTV staff member Andrew Eldridge, they knew there was a show in the stories he was telling. A pilot episode of “The Folklorist” made its debut a few months later, and its popularity set the wheels in motion. The 2013 season was coproduced by Eldridge and fellow staffer Angela Harrer, and NewTV now has eight half-hour episodes, each consisting of several segments, three to seven minutes long, depicting interesting moments from the 1700s to the recent past. Most of the sets and props are made by Eldridge, Harrer, and interns, and they either make costumes or rent them. “Part of the charm of the show is that it’s homemade, it’s not computer generated,” Eldridge said. “It’s got a kind of PBS charm to it,” Harrer said. All of the episodes are written by either Eldridge, Harrer, or Horrigan. The show has been shown on community media stations in states all across the country, and several school systems have called to say they are using episodes in history classes, according to Kelly. Eldridge and Harrer both studied film in college, and taught the 18 interns who worked on “The Folklorist” last season how to work the cameras and edit. They do several layers of sound editing to make the background noises realistic, according to Harrer, who said it can be tricky to re-create the effect of several tables of people talking in a cafe, or a breeze blowing, in synch with the action in the video. “That can be really challenging,” said Harrer, who said she and Eldridge can work through several nights to finish shooting and then editing an episode. But, they both say, being able to create their own scripted television show is special. They are currently working on a scripted comedy about historical reenactors. Episodes of “The Folklorist” are available online at folklorist.newtv.org .